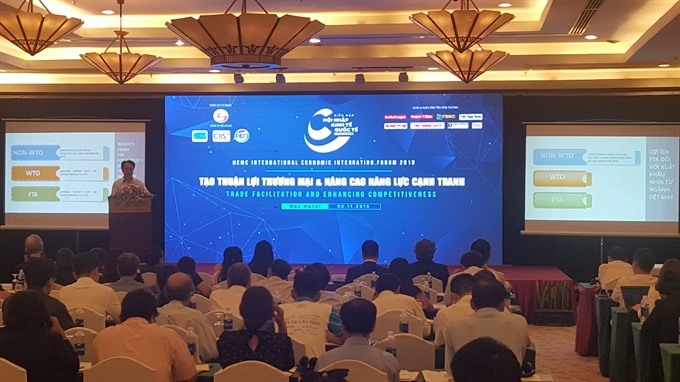 HCM CITY – Free trade agreements (FTAs) may have significantly reduced import tariffs in many markets for Vietnamese goods, but administrative reform, reduction of trading costs and improving the business environment are key to improving national competitiveness, a forum heard in HCM City yesterday. Phạm Bình An, director of the HCM City International Integration Support Centre, told “The HCM City International Economic Integration Forum 2018: Trade facilitation and enhancing competitiveness” that Việt Nam had 17 FTAs with 60 nations and they offer the nation’s economy the chance to transform. He cited the example of the textile industry where non-WTO import duties were 150 per cent, but when a nation joined the WTO it went down to around 25 per cent. Under FTAs, the figure fell to 0 -5 per cent, he said. “Export turnover has sharply increased from US$5.4 billion in 2006 to $213.8 billion this year. “FTAs have promoted administrative reform by the Government, improved infrastructure, ensured equality in accessing resources, removed barriers to accessing markets, and simplified conditions for business. “FTAs provide assured market access since the WTO is facing many challenges. Việt Nam’s FTAs are in all five continents and that would help limit risks. “FTAs have reminded enterprises about the potential of the domestic market of over 90 million people. 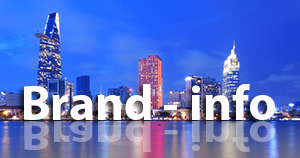 “FTAs have created opportunities for Vietnamese firms to participate in global supply chains. Right now there are 200 domestic companies supplying accessories to Samsung. “FTAs have brought strong pressure to effect administrative reforms and change business practices since both the Government and business community must follow their rules. Nguyễn Ánh Dương, head of the Central Institute for Economic Management’s macroeconomics policy department, said: “Việt Nam’s trade costs are estimated to decrease by 18.3 per cent if the commitments under WTO’s Trade Facilitation Agreement are fully implemented. In the World Bank’s trading across borders rankings, Việt Nam is 94th out of 190 countries, in the World Economic Forum’s enabling trade index, it is 73rd out of 136 nations and in the World Bank’s logistics performance index, it ranks 64th out of 160. Dương said: “The Government aims to transform progressively specialised inspection from largely ex-ante inspection to largely ex-post inspection in line with risk management principles and regulatory compliance of individuals and entities. It is hoped basically to eliminate the incidence of one goods being subject to management and specialised inspection by more than one agency, reduce the number of goods subject to specialised inspections by at least 50 per cent and reduce the import batches subject to specialised inspections for custom clearance from the current 25 – 27 per cent to below 10 per cent." At the forum, the setting up of the Việt Nam information trade portal at http://vietnamtradeportal.gov.vn was announced. 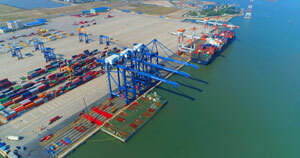 “The portal covers information and regulations related to export/import/transit,” Hoàng Hồng Diệp, consultant to the World Bank Group, said. According to the World Economic Forum, if nations can improve border administration and transport and communications infrastructure halfway to global best practice, global GDP can add 4.7 per cent, equivalent to US$2.6 trillion, global trade can grow by 14.5 per cent, equivalent to $1.6 trillion, and the benefits from trade cost reduction can be much higher than from tariff reduction. The Government’s efforts to create and sustain a favourable environment for trade have not been very successful. The event attracted 300 attendees, including officials from HCM City, related ministries and departments, international organisations, business groups, universities, and research institutes from HCM City and neighbouring provinces.